RATATOUILLE . WORKS ON THE DS / DS LITE / DSi. Nintendo DS, DSi, 3DSDS DS Lite DSi DSiXL 3DS. For All DS console( DS, DS Lite, DSi, DSiXL and 3DS). 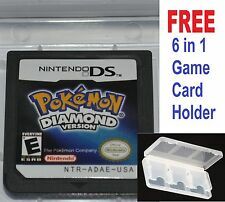 POKEMON DIAMOND VERSION. DS Pokemon Pearl UK Version Nintendo DS Cartridge DS DS/DSI/DSL/DSI XL/3DS . Condition is Like New. Dispatched with Royal Mail 2nd Class Large Letter. Nintendo dsi in exellent condition with 13 games and charger. NINTENDO DSI red with 13 games and charger. Condition is used but in exellent condition. Has sd slot for extra storage. Games are = Mario party ds. Secret files Tunguska. Sonic Sega all stars racing. Brain age 2. Madagascar 2. Witches and vampires. Ghostbusters. Pokemon pearl. Simanimals. Cars. Ninja gaiden. Kingdom Hearts. King Kong. New listing101 Games in 1 Explosive Megamix Nintendo DS, DSi, DS Lite, 2DS & 3DS MINT GAME! Welcome to my auction for 101 In 1 Explosive Megamix Game for Nintendo DS. This game is in as new condition and is fully working. It comes with all it's original inserts and box. It is also compatible with Nintendo DS, DS Lite, DSi, 2DS and 3DS. Any questions please ask. Please see my other items. Thanks for looking. 4 out of 5 stars - 101 Games in 1 Explosive Megamix Nintendo DS, DSi, DS Lite, 2DS & 3DS MINT GAME! 8 product ratings8 product ratings - 101 Games in 1 Explosive Megamix Nintendo DS, DSi, DS Lite, 2DS & 3DS MINT GAME! BAKUGAN BATTLE BRAWLERS ORIGINAL NINTENDO DS DSi 3DS GAME CARTRIDGE. Condition is Good. Dispatched with Royal Mail 1st Class Large Letter.What you see in pictures is what there is,kids no longer play DS games now and this is the last game to go. Jenga World Tour. Nintendo NDS. DSi/DSi XL. ZOO KEEPER ACTION PUZZLE GAME * NINTENDO DS GAME / DS LITE / DSi . 100% genuine. Condition is Acceptable. Dispatched with Royal Mail 2nd Class Letter. Can also be played on the Nintendo 2DS and 3DS consoles. Sonic Rush. all saved data erased so you'll start from new! Nintendo DS, DS Lite, DSi, DSi XL & 3DS. Disney Tangled. CAN ALSO BE PLAYED ON THE 3DS BUT ONLY IN 2D. NINTENDO DS DSI 2DS 3DS GAMES BUNDLE X12 ETC CARTS ONLY. Condition is Good. Dispatched with Royal Mail 1st Class Large Letter. For All DS console( DS, DS Lite, DSi, DSiXL and 3DS). POKEMON PLATINUM DS. Plug and play / compatible with all DS, DS Lite, DSi, DSi XL, 2DS, 2DS XL, 3DS and 3DS XL versions, no preparation needed. ALVIN AND THE CHIPMONKS. CAN ALSO BE PLAYED ON THE 3DS BUT ONLY IN 2D. Nintendo DS Nintendogs Dachshund & Friends Game DS/DSi/XL/3DS. Condition is Like New. Dispatched with Royal Mail 1st Class Large Letter. NEPOETS PUZZLE ADVENTURE. CAN ALSO BE PLAYED ON THE 3DS BUT ONLY IN 2D. COOKING MAMAS WORLD OUTDOOR ADVENTURES. CAN ALSO BE PLAYED ON THE 3DS BUT ONLY IN 2D. SAM POWER FIREFIGHTER. IN VERY GOOD CONDITION. Educational puzzle solving for all ages! Ability to read required. Nintendo DS, DSi, 3DSDS DS Lite DSi DSiXL 3DS. For All DS console( DS, DS Lite, DSi, DSiXL and 3DS). POKEMON PEARL VERSION. BUNNYZ . THIS IS 100% GENUINE. SERIAL NUMBERS CAN BE SUPPLIED ON REQUEST. BE CAREFUL THERE IS A LOT OF FAKES DOING THE ROUNDS. Apply: DS, NDS, NDSL NSDI 3DS. Version: US Version. R4 Card for Nintendo DS, DS Lite, DSi and DSi XL. No Memory Card. R4 Card for Nintendo DS, DS Lite, DSi and DSi XL. No Memory Card, would have to buy separately. Never used, condition is like new. Pokemon: Black Version 2 (Nintendo DS). This will also be compatible with DSi, 3DS and 2DS systems. NOTE: Nintendo Wi-Fi capabilities are now DEFUNCT. The servers were shut down a few years ago so you cannot trade or battle other players online. Hasbro Family Game Night for the ds. Cartridge only. Any questions please ask and be sure to check out my other ds games for sale. Thanks for looking! If you have any problems at all with your purchase please do contact me first before leaving feedback. All issues can be put right if you let me know. I am a trusted seller and i will always help out customers. If by some slim chance you wish to return an item to me, please just drop me an email and this can be sorted out very quickly. There is no need to go through ebay's returns process as i am an honest and helpful seller and this may take longer. OVER THE HEDGE. CAN ALSO BE PLAYED ON THE 3DS BUT ONLY IN 2D. MATHS TRAINING . WORKS ON THE DS / DS LITE / DSi. Genuine EUR / PAL Version. Pokemon: Platinum Version (Nintendo DS, 2009) DS DS/DSI/DSL/DSI XL/3. Condition is Like New. Dispatched with Royal Mail 1st Class Large Letter. THE MAGIC ROUNDABOUT. CAN ALSO BE PLAYED ON THE 3DS BUT ONLY IN 2D.